Algeria biggest union and most influential political party di National Rally for Democracy don follow di kontri army join mouth say make di kontri president Abdelaziz Bouteflika resign. Inside statement wey di party wey be member of di ruling coalition release, dem want make dem declare presido Bouteflika unfit to rule di kontri. Dis one dey come di day afta di army chief Lt Gen Ahmed Gaed Salah say make dem find constitutional way to remove di president from office. 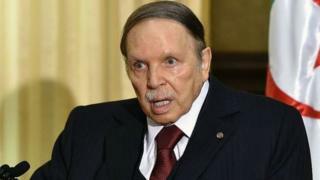 Di General Union of Algeria Workers wey don dey support di president tey-tey also follow dey ask Bouteflika to step down. For some weeks now Algeria kontri pipo don dey road dey do I-no-go-gree as president Abdelaziz Bouteflika wey don dey office for 20 years still wan do anoda term. Di protest make am decide say im no contest again for anoda term, but im pipo continue to para say dem want sharp-sharp change. Since afta im get stroke for 2013, di oga presido no too dey show for public again, and now, im strong supporters want make im and di whole ruling class comot from office. Oga Bouteflika bin follow fight Algeria war for independence. Wit military support im become di kontri leader afta di 1990s civil war and im pipo respect am plenti. Im no dey travel upanda weda inside or outside di kontri unless im dey go for treatment. Di Constittutional Council must agree to begin process Article 102 of di constitution. Dis article go allow di council declare say di position of di president dey vacant sake of di leader no dey fit to rule. Afta dat one di two chambers of parliament go meet to vote weda di president fit perform in duty. Dem go need two third majority. If dis one pass, di speaker of di upper parliament wey dem dey call Council of Nation fo take over di work of di president. Di new provisional head of state go rule for 45 days to prepare presidential election. Di provisional president no go fit follow do election.